Melissa Shiff was a finalist - her work JAMS was selected to be in this international group show along with artists Ken Goldman and Jacqueline Nicolls. Professor Melissa Shiff and Louis Kaplan co-present on a panel entitled "Ararat's Augmented World: Screen Plays for a Mobile Homeland." at HASTAC 2013. The theme of the conference is "The Storm of Progress: New Horizons, New Narratives, New Codes." York University Professors Shelley Hornstein (Architectural History and Visual Culture) and Janine Marchessault (Canada Research Chair in Art, Digital Media, and Globalization) are the other participants. Professors Melissa Shiff, Louis Kaplan, and John Craig Freeman have been invited to conduct augmented reality walking tours on the Mapping Ararat site. The first tour will be for a digital art class taught by Professor Stephanie Rothenberg and the second tour will be for an art history class taught by Professor Elizabeth Otto. 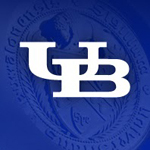 The event is sponsored by both the Humanities Institute and the Department of Visual Studies of the University at Buffalo. Professors Melissa Shiff and Louis Kaplan have been invited to present "Mapping Ararat: Augmented Reality and the Imagining of a Jewish Homeland" as part of the workshop "Mining Imagination: Ethnographic Approaches Beyond Knowledge Production" to be held at the Mahindra Humanites Center, Harvard University in Cambridge, Massachusetts. The workshop is on April 6th and it is organized by Dr. Michaela Schäuble (Post-Doctoral Fellow, Visual Anthropology). Other participants include Professors Lisa Cartwright, Andrew Irving, Kathryn Ramey and Paul Stoller. Project Director and Lead Artist Melissa Shiff, in conversation with the noted journalist Renee Ghert-Zand at the Feast of Jewish Learning - Palo Alto, January 26, 2013. The theme selected for the evening is Dreams and Schemes. Perfect for a discussion of Mordecai Noah and the Mapping Ararat project. Adam Rovner "Mordecai Noah's Ararat In light of Jewish Territorialism"
Melissa Shiff, Louis Kaplan, John Craig Freeman "Mapping Ararat: Envisioning a Virtual Jewish Homeland"
Featured in group exhibition "With This Ring"
Melissa Shiff's work to be included in a book containing over 50 established and emerging artists whose art and design says something new about Jewish art in the 21st century. Melissa Shiff has been appointed to a three year term in the Department of Art at the University of Toronto. Her title is Assistant Professor. During her tenure, her research will be focused on the SSHRC Insight Development Grant "Mapping Ararat." SSHRC (Social Sciences and Humanities Research Council of Canada) has awarded Melissa Shiff a major grant for the research and creation of her collaborative project: Mapping Ararat: An Imaginary Jewish Homelands Project. This project will utilize the cutting edge technology of augmented reality to imagine an alternative history for Grand Island New York creating an on site walking tour for this Jewish homeland originally proposed by Major Mordecai Noah in 1825. Shiff's collaborators are new media artist, Professor John Craig Freeman of Emerson College in Boston and photography and new media historian, Professor Louis Kaplan of University of Toronto. and Don Heights Unitarian Congregation. "The Medium is the Matzo", is a one-of-a-kind, once-in-a-lifetime mashup of art, music, technology, and matzo that brings the ancient Passover holiday to life for audiences of every persuasion and any age. Indie Star Josh "Socalled" Dolgin to Perform Rarely Heard "Socalled Seder"
A two day symposium devoted to the cross-disciplinary investigation of the multiple meanings of European Jewry before, during and after the fin de siècle. Melissa Shiff's lecture, "ARK: Restaging the Jewish Museum in Prague", will be held on September 20th at 7:30pm. A multi-media Passover Happening with artist Melissa Shiff and Professors Doris Bergen, Ritu Birla, Harriet Friedmann & Michelle Murphy. Times Square Seder, The Medium is the Matzo and Cine-Seder Plate are all art-activist Passover Happenings created by artist Melissa Shiff. For this event, Shiff will install her award winning video sculpture Cine-Seder Plate and invite local scholars to respond to the questions raised in her video projection. With this project, as in all of her reinvented Passover projects, Shiff asks us to think about Passover in light of contemporary problems that plague us today. Excerpt, Page 172: " On occasion, a bride and groom conceptualize their wedding as an original work of art of their own making, in which mediation defines the structure of the celebration as forthrightly as religious protocol. Such was the case when media installation artist Melissa Shiff and her husband, art historian Louis Kaplan, planned their wedding, which took place in Toronto on 12 October 2003. 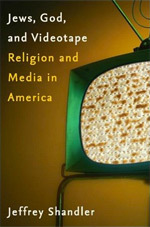 Shiff describes the ceremony as a reinvented ritual, using "postmodern artistic strategies" that negotiate "between contemporary performance art and the customs of the traditional Jewish wedding." Presentation of ARK on "The Language of Sculpture" panel. The ISC's 22nd International Sculpture Conference will explore and consider the potential of sculpture in the 21st century - to provide an opportunity to both celebrate its vitality and diversity, its capacity to challenge, and to examine its current position, function and production. 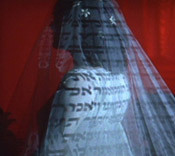 Shiff's Postmodern Jewish Wedding is exhibited in this group show. Shiff's JAMS (Jewish Animated Mandalas) will be on display. Since the late 1960's, and especially in the 1980's, Judaica objects have held a significant place in the work of Jewish artists in Israel and abroad: Judaica – not yiddishkeit. In centers of contemporary art, these objects furnished the source of a radical, critical motif which was woven into the artistic discourse. This video presentation addresses Shiff's recent projects that have remediated parts of major Jewish Museum collections and where Shiff was able to create compelling visual spectacles in the process. Melissa Shiff's Postmodern Jewish Wedding in Group Show. This group exhibition features video and photographic works by three artists: Lucy Levene (UK), Devora Neumark (Montreal) and Melissa Shiff (Toronto). These artists reclaim and rewrite aspects surrounding Jewish marriage rituals, by questioning certain patriarchal traditions of courting, wedding and divorce. Melissa Shiff has recently been appointed Adjunct Professor in the Centre for Jewish Studies at the University of Toronto for a three year term. The appointment of Adjunct Professor is given only to distinguished individuals who have special expertise needed to complement academic programs. Melissa Shiff will create a CINE-Seder Plate, rethinking this form in a cinematic style. This will be the first Invitational exhibition in the new museum designed by Daniel Libeskind. It will also celebrate the Museum's 25th anniversary. Melissa Shiff has been invited to give the biannual endowed Samuel and Bettie Roberts Lecture in Jewish Art in the spring semester of 2009. More details to follow. "The spectral character of Shiff's projections coupled with footage and photographs of people and places that survive only as images, capture perfectly the tragic aspect of this historical chronicle." "Shiff joins a handful of media artists, includling Bill Viola and Mary Lucier, Beryl Korot and Chantal Akerman, who have placed this contemporary form of the moving image arts in the service of probing the past - creating time machines that transport us into historic sites, sacred spaces, and arenas that challenge the limits of sacrifice and faith." "Shiff is an artist who is decidedly activist, in all senses of the word. Assuming that activism also implies questions of "access" and "affect," Shiff looks for the transformative possibilities of religion and culture by using a keen sense of philosophical subtlety and opening up spaces for emergent discourse through interrogation and constant critique. Ultimately, art and faith must be regarded as issues of contingency and exchange in order to stay vibrant, relevant, and powerful." As the most elaborately celebrated of Jewish life cycle events, weddings provide rich opportunities to consider the intersection of media and Jewish religious life. Scholars, artists, curators discuss the visual and material culture of weddings including photography, videography, music and their portrayal on stage and in film. Melissa Shiff has been invited to present her work at the Natalie and James Thompson Art Gallery. Off the Wall: Artists at Work is a two-week open studio project featuring 12 artists working and performing in the galleries. Representing a new generation with strong Jewish social networks or a familiarity with Jewish rituals and symbols, artists will create a work-in-progress and exhibit other work in various media including fashion, music, performance art, video and new technologies. Events include concerts, salons, a runway show, and a Purim party. Levi Okunov’s Fashion Show with video projections by Melissa Shiff and a live mix by diwon. Other musical guests include Smadar and Y-Love. This exhibition highlights a group of contemporary ceremonial artwork from The Jewish Museum’s collection. These works, innovative in design and message, explore a wide range of contemporary issues facing both modern Jewish life and broader society. Melissa Shiff has been invited to lecture about her work at Evergreen State College in Olympia Washington. 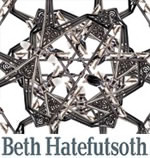 She will also give a lecture at Temple Beth Hatfiloh. Susan Chevlowe, Adjunct Assistant Professor of Jewish Art and Visual Culture at the Jewish Theological Seminary, writes on the work of Melissa Shiff and Hannah Iverson in Nashim: A Journal of Jewish Women Studies and Gender Issues. Melissa Shiff has been invited to present her work at Limmud UK at the University of Warwick in Coventry England. "For the most part, museum displays of Judaica utilize the “treasure” mode... I argue that recent artist projects (eg. Larry Abramson’s Searching for the Ideal City, 2006, at the Magnes Museum, San Francisco and Melissa Shiff’s Ark, 2006, at the Jewish Museum in Prague) shift the paradigm and, in so doing, reanimate both the artifacts and the museum. Rather than emphasize a lost or aestheticized past, these temporary artist projects, working with and against the habitual forms of displaying Judaica, offer new ways for viewers to understand and experience Judaica." Engaging Contemporary Art in Jewish Studies: A Scholar's Rountable with Three Contemporary Toronto Artists. Melissa Shiff Shortlisted for Fort-York and Original Lake Ontario Shoreline Public Art Competition for the City of Toronto. Currently, Toronto Culture is seeking to commission an artwork that delineates the original Lake Ontario shoreline and related features, which can be traced along the north side of Fort York Boulevard. It is expected that the artwork will illuminate the Fort’s original relationship with the lake, and act as a landmark for a new entrance to the city’s most important historic site. When the iconoclastic Moses descends the mountain holding The Ten Commandments to find his people dancing around the golden calf, the party’s over. In contrast to Judaism, Hindus worship the cow as holy. This tension between what religious cultures hold sacred is at the heart of Melissa Shiff’s ICONOCLASH. Shiff projects iconic movie scenes onto Toronto’s temple of art (the AGO façade) and pairs this with a multicultural music mix to create an interactive dance party. Superimposing the audience into these scenes via video technology, ICONOCLASH focuses reflection on the question of visual representation and the function of the icon in different cultures. Other participating artists: Dread Scott, Susan E. Evans, Vagner M. Whitehead, and others. Melissa Shiff will exhibit her "Crush Oppression Pillow Project" as part of this group show. "The positive promise of globalization, of all good things shared and accessed by all, has yet to be fully realized - we still live with disease, terrorism, starvation, and inequality and few people control the majority of goods. Articulating an array of personal perspectives, the artists in this exhibition come from a diverse and expansive range of nationalities and ethnicities exploring different facets of globalization in their artistic practice..."
Command J: Jewish Laws Digital Arts­ Group exhibition as part of the ReJewvenation conference. Opening Reception: October 23rd 3- 7pm at XPACE in Kensington Market, 303 Augusta Ave. Toronto. Thanks to the Toronto Arts Council for supporting this project. 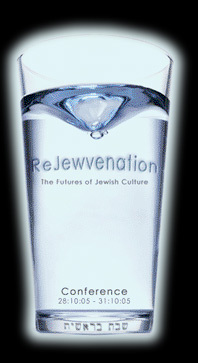 ReJewvenation: The Futures of Jewish Culture, University of Toronto conference. There will be a Visual Arts panel at the ReJewvenation conference in conjunction with the exhibition to be held at The Robert Gill Theatre, 214 College Street, 3rd Floor featuring presentations by Norman Kleeblatt, Carol Zemel, Jessica Wyman and Louis Kaplan, 3-5 pm. Professor Jessica Wyman (OCAD) will be presenting "Cutting Gender, Splicing Ritual: Melissa Shiff's Gender Cuts/The Jew Under the Knife"
Artist Talks - Toronto Artists Simon Glass ("The Ten Commandments/Prohibited Weapons") and Melissa Shiff ("Gender Cuts/The Jew Under the Knife") discuss their works at XPACE, 303 Augusta, Kensington Market, 3 pm.